Functions: 1. To stop cough and soothe asthma; 2. To moisten the intestines and move feces. 1. Constipation due to dryness in the intestines. Perilla seed (Suzi) is used with Hemp seed (Huomaren), Trichosanthes seed (Gualouren) and Apricot seed (Xingren). 2. Upward perversion of lung qi caused by excessive phlegm fluid manifested as cough with white profuse sputum, or asthma and fullness and stifling sensation in the chest and hypochondriac region. 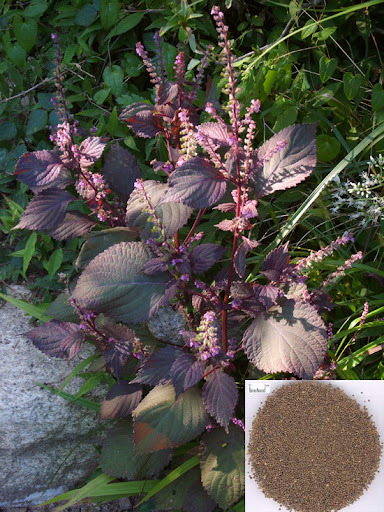 Perilla seed (Suzi) is used with White mustard seed (Baijiezi) and Radish seed (Laifuzi) in the formula Sanzi Yangqing Tang.